Pizza, a vegan safe option. At Oscar and Rosie’s they have a variety of pizzas with fake meat; something we’d never had before in a restaurant! It had a rustic vibe to the place; scaffolding pipes and ply wood exposed everywhere. We did wait quite a while for the pizzas to be delivered to our table and I was starting to show my hangry side but the pizza soon calmed me down with it’s fake meaty flavours. Boom chick-ish wah wah was our chosen one: vegan chicken, fakon, caremelised red onion, flat mushroom and Oscar’s tomato sauce. The waitress informed us the pizzas were big enough to share, but to be honest I definitely could have eaten one to myself no problemo. We also ordered some wedges though and they were delish. Pizzas are all £14 and wedges are £3. Breakfast here when in Nottingham is an absolute must. It’s cute interior, vegan/allergen friendliness and attentive staff were wonderful; the food and coffee even better. They also offer a couple of vegan sandwiches for lunch, including a lentil pâté! You can tell they’re very passionate about what they do and it certainly shows. 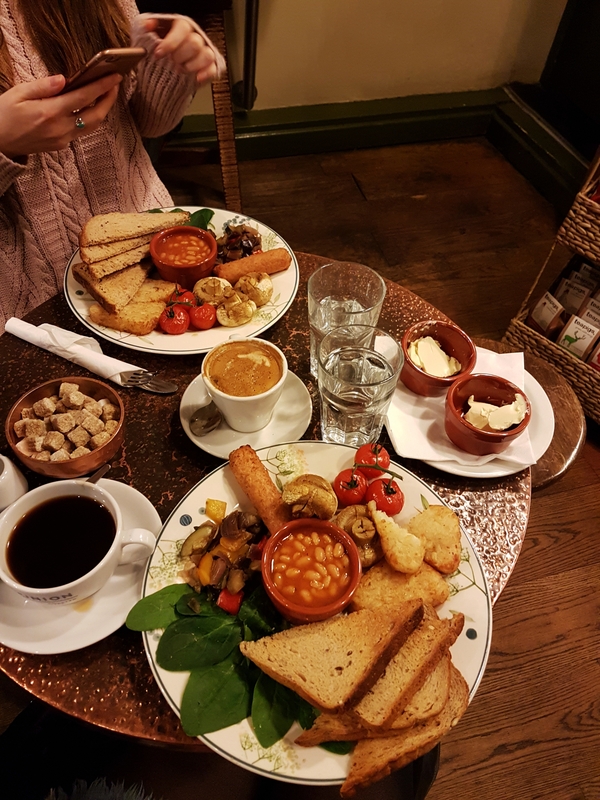 The vegan breakfast was an obvious choice for us both and it was unbelievably filling (and only cost £6.95)! It consisted of healthy portions of roasted Mediterranean veg, hash browns, beans, a Linda McCartney saussie, vine tomatoes, mushrooms, spinach and toast. My only criticism is that the spinach arrived completely uncooked and looked a little sad at the side of the plate. Annie’s Burger Shack had to be the winner here. Glancing at the menu, you wouldn’t know they served vegan food as it’s a long list of very meaty burgers. However, at the top it explains everything listed is available for meat eaters, veggies and vegans. Every single one. The only problem was, the descriptions for the burgers were for the meat versions and it didn’t provide any further explanation how they were substituting the meat etc. for us veggies and vegans. Never mind, we asked at the bar and everything was fine. Annie’s operates a system where they have a more formal dining experience upstairs with table service and an underground room for a relaxed vibe where you order at the bar. They even had board games and pac man on an old games console! All burgers come with a choice of fries, curly fries or wedges and cost between £9 and £13. I opted for The Delta: a patty covered with ‘cheese’, burger sauce, onion rings, jalapeños and black olives and Niamh chose the BB King: a ‘chicken breast’ smothered in BBQ sauce. If we hadn’t had eaten so much already that day we may have been a bit more adventurous! 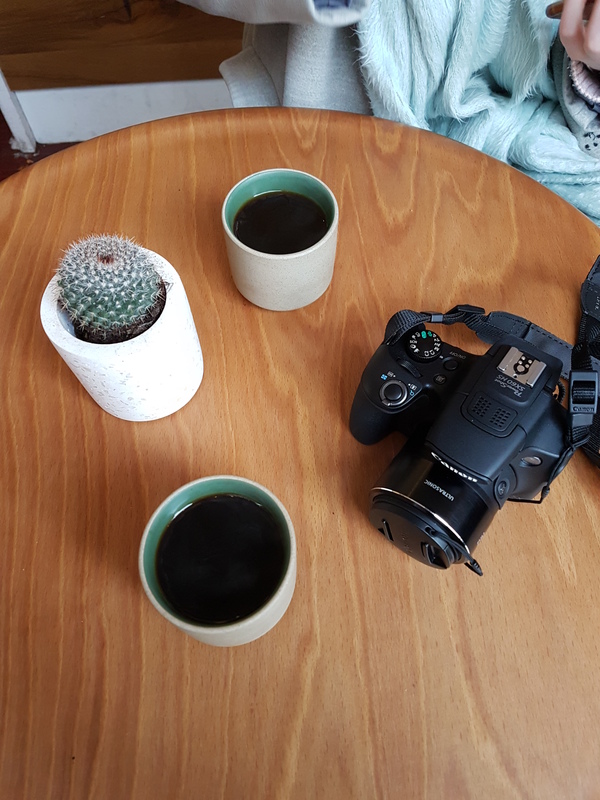 We visited a couple of coffee shops whilst in Nottingham, but our fave was definitely OutPost Coffee. Good quality is a clear focus for them, roasting in house and paying the growers a fair wage. It’s a tiny little place and we were lucky to grab two of the eight or so seats. Open from 8-5 Mon-Fri, 9-5 Sat and 10-4 on Sun, get yourself down to OutPost for a beautiful cup of strong and flavoursome coffee. We didn’t eat here, but I did spy a vegan ciabatta in the fridge which looked very tempting. 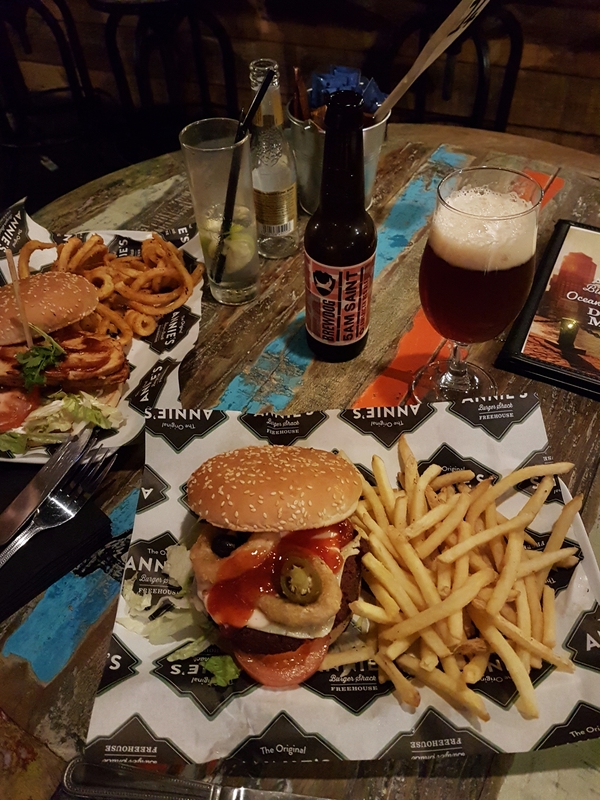 All in all, Nottingham is a very good place for vegans to visit! Let me know some of your favourite places in the comments below.